- Made of high quality metal to ensure sturdiness and durability, nice finish. - We have 3 different size shelf bracket, you can choose the right size to fit your need. - Suitable for decorative home/office shelves or mounting cisterns, sinks, roof supports and frames etc. - Puta plank on them, can display different items, such as floral, photoframe, books, etc. A great decoration for your home. It also can used indifferent places, like hospital, hotel, bar, cafe, shopping mall, etc. Made of high quality metal to ensure sturdiness and durability, nice finish. 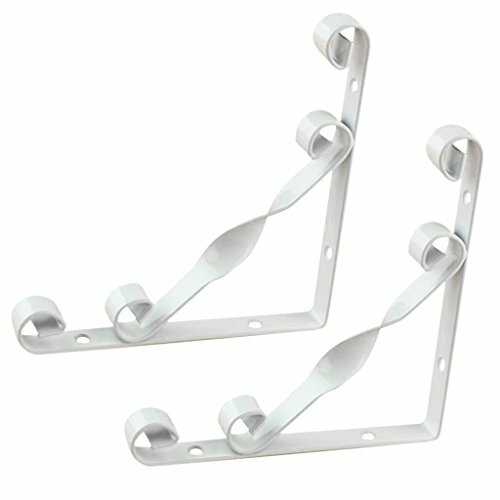 We have 3 different size shelf bracket, you can choose the right size to fit your need. Suitable for decorative home/office shelves or mounting cisterns, sinks, roof supports and frames etc. Put a plank on them, can display different items, such as floral, photo frame, books, etc. A great decoration for your home. It also can used in different places, like hospital, hotel, bar, cafe, shopping mall, etc.